Children can attend Pre-Reception from the moment they are two years of age. Our sessions are flexible and parents can have the choice of morning only sessions (8.45am to 12.15pm), full (school) day sessions (8.45am to 3.10pm) or extended day sessions (8am to 6pm). There is also the added flexibility to start morning and full day sessions from 8am and/or finish the day at 4.30pm. On entry to St John’s Pre-Reception children from the age 2 to 3 years enter our Garden Room. It is on entry that we work closely with your child and you to create a secure relationship, to ensure your child is happy, nurtured and most importantly settles quickly. At such a key point of your child’s development will be through play based activities. In the younger ‘Garden Room’ our Pre-Reception children often sleep after their lunch. We will work with parents to ensure their child’s routine is maintained. Children in our three to four year old ‘Orchard Room’ have the opportunity to participate in PE twice a week in our Sport England Sports Hall with our specialist teachers, children are also involved in the annual Christmas Production and Harvest Festival and Sports Day. During the last term prior to going into Reception a lot of preparation is made to help the children’s transition through considerable work on children’s phonic skills which leads to them starting to read, pencil control and familiarising them with the school routine. The Pre-Reception staff in both rooms aim to encourage children’s development through creative play, themed activities and overall stimulating them in a fun, secure and positive environment. In Pre-Reception, children are provided with a healthy snack and either milk or water mid-morning. For those children staying all day, lunch is also provided. For two to three year olds lunch is served in the Garden Room and three to four year olds are taken across to the dining hall and can choose from a range of hot dinners which are prepared on-site by our catering team. We offer a varied menu including meat, vegetarian and a jacket potato choice each day and will cater for any allergies. All children in Pre-Reception will be required to wear a St John’s School Pre-Reception uniform. The uniform is both smart and practical and consists of a tracksuit, polo shirt and shorts for summer. All items will form the PE Kit when your child enters our Reception class and begins to wear the full school uniform. All children in Pre-Reception are given a communications book that is taken to and from school in their book bag. This book is our way of knowing what is going on with your child on a day to day basis. In the Garden Room (younger room) we note toileting/ nappy changes, food intake, drink consumption and what they have been doing throughout the day. Each child in Pre-Reception will bring home an end of term report highlighting their achievements throughout the last term. Our Pre-Reception staff also use Tapestry, an online programme, to document your child’s key developmental milestones. 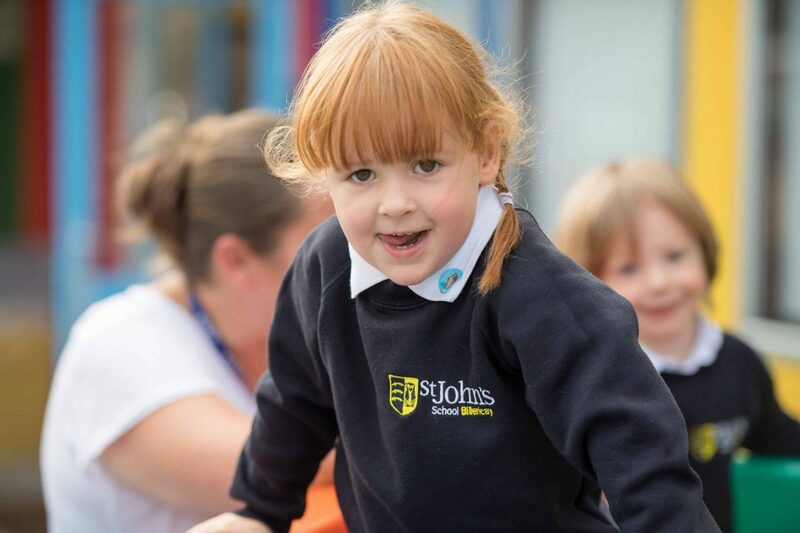 St John’s School has an Open Door Policy for all parents and carers and our Pre-Reception staff are always available to discuss any matter concerning your child. 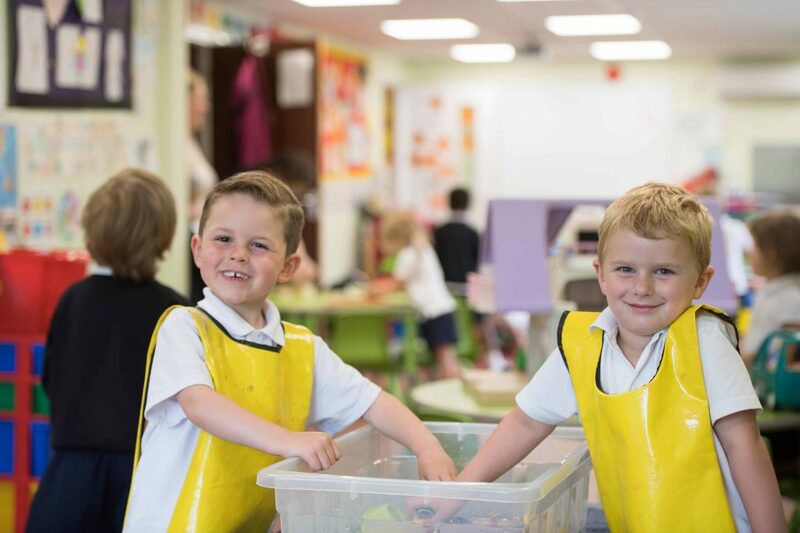 At St John’s, we follow the Early Years Foundation Stage (EYFS), the statutory curriculum to be used for children aged 0 – 5 years and this sets out the typical achievements at each age and stage. Each child’s development will be monitored against the EYFS and progress recorded through a learning journal. Each child is allocated a key-worker who develops a close and trusting relationship with both the child and their family – our open-door policy means that it is always possible to discuss any worries or queries immediately and families are encouraged to play an active role in their child’s development. Communication books provide another means for parents to keep the school updated and vice versa.